Even in mourning it is important to remember and honor a life well lived. This beautiful basket of purple and white flowers blended with vibrant greenery is a wonderful way to pay tribute to one who has indeed lived a full life. 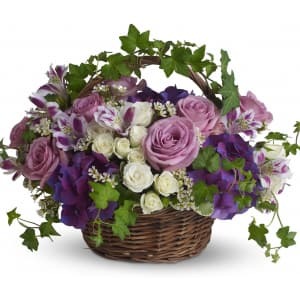 • Brilliant flowers such as purple hydrangea, lavender roses, white spray roses and waxflower are arranged with beautiful ivy and more in a lovely round basket. Flowers will be received by a Malcore Funeral Home & Crematory's staff. Ordering was easy, did not attend but was told the flowers were very pertty. 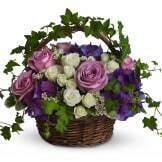 Although the basket was a little smaller than I expected, it was beautifully done. I appreciate the fact that it came so quickly and the flowers were so fresh. I would use your service again if the need occurs. Thank you. The arrangement was smaller than I thought it would be for the price, but it was beautiful and looked exactly like the photo. 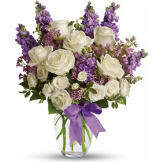 I ordered late, but the flowers arrived on time, I thank you for taking care of me. Thank you for the beautiful flowers. There were many others there but yours was the center piece! The help provided by "Basime" was wonderful. She was very informative, patient, sympathetic and had great suggestions. I am convinced that because of her, I picked the perfect gifts for a very special lady who will be missed dearly. There were so many awesome choices! The cookies were the best and the flowers beautiful. I'm from N.E., the cost was comparable. Thank you, for making this process easy-please let Basime know how much her gentle and kind assistance was appreciated. I was extremely happy with this arrangement to honor my grandmother. 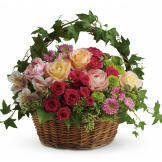 It is pricey, but very full with good quality flowers and time was put into the basket to make it beautiful. 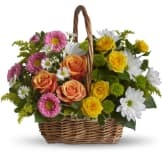 All of our flowers are designed and delivered by hand from a local florist in in Green Bay.